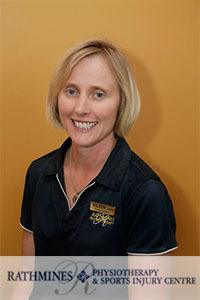 Eileen Lavis graduated from the University of Sydney in 1993 with a degree in Physiotherapy. Eileen worked in an allocation and permanent position at Nepean Hospital and concurrently gained experience in private practice in Richmond. Eileen worked in Canada for 6 years for herself and in 3 clinics, one of which she played a fundamental role in its successful establishment. All clinics were multi-disciplinary, with a strong focus on rehabilitation. Eileen was responsible for client treatments, conducting functional abilities examinations as well as designing / implementing work conditioning programs. Eileen returned to Australia, securing a permanent private practice position in Narellan, where she was able to consolidate and expand her experience in rehabilitation, continence and pelvic floor physiotherapy and pain management. In 2002, Eileen and her husband Garry acquired Rathmines Physiotherapy & Sports Injury Centre, continuing the focus on individualized rehabilitation using hands on therapy and activity based programmes as well as continence and pelvic floor rehabilitation. Eileen gained her Post Graduate Certificate in Continence and Pelvic Floor Rehabilitation from Melbourne University in 2002 which further expanded her knowledge of continence and pelvic floor conditions. Eileen and her team are the only Physiotherapists solely specializing in private practice continence and pelvic floor Physiotherapy in The Lake Macquarie, Newcastle and Hunter region. Eileen was awarded The Continence Foundation of Australia 2008 National Conference Scholarship. Eileen is a clinical educator for pelvic floor courses provided to Doctors, Physiotherapists and Nurses with Chiarelli Healthcare. Eileen is a clinical supervisor for undergraduate Physiotherapy students at Newcastle University. Eileen presents at conferences and medical inservice programmes and provides book reviews for international journals. Eileen provides input into the development of continence pathways for Hunter New England Health Service. Eileen is passionate about improving the continence status of Australians and often conducts education sessions for community groups. If you would like Eileen to provide an education session at your workplace, community group or school please contact the clinic via email the contact us section of the website or phone 4975-1622. Eileen has completed several post graduate certificates, and is committed to regular attendance at continuing education events and conferences to enable current research and theories to be implemented into client treatment. Recently Eileen won the 2013 Continence Foundation of Australia Graduate Certificate in Continence and Management Scholarship. Childrens Bedwetting and Continence issues.